Have I mentioned before that I love risotto? I also love adding different ingredients and experimenting with new flavors and textures, and have been happy with all of my creations so far. Click here to see all of them. I've been loving caramelized onions lately so I decided to keep it going and try them in risotto. Add the rice; stir for 1-2 minutes. Add the chicken broth 1 ladle-full at a time, letting it fully absorb before adding more. This process takes about 17-25 minutes, depending on the day! Before the final ladle of broth, add the caramelized onions and spinach. I chopped the onions so they wouldn't be too long and stringy next to the small grains of rice. Another delicious risotto! Using the pan that the onions cooked in was a great way to infuse the oil with the sweetness of the onions, therefore giving the risotto more flavor overall. We both loved this and I think it might be my favorite yet. Another one to add to the list! I keep seeing risotto recipes, and I think it's crazy for the peak of summer! It's hot enough in my kitchen, so I couldn't imagine eating risotto at this point. 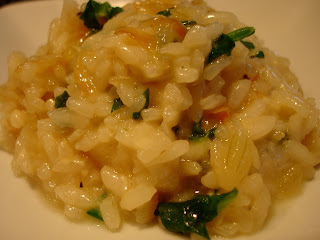 But I do love risotto, so I don't really blame you ;) Caramelized onions sounds like an awesome add in! mmm sounds like a great combination! i'll have to try it! i made this for my parents tonight, they were so impressed! it tasted light and delicious, thank you so much!